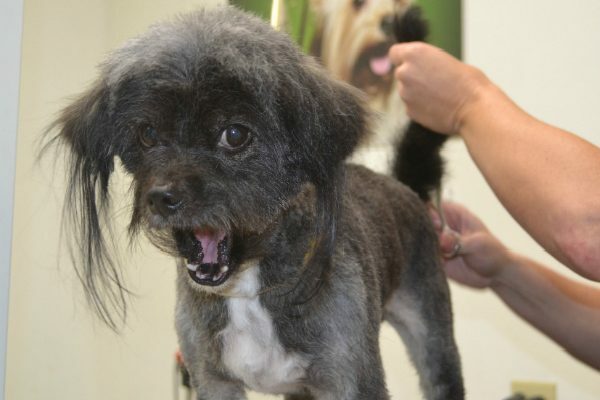 Sometimes a haircut shaves off more than just matted fur. 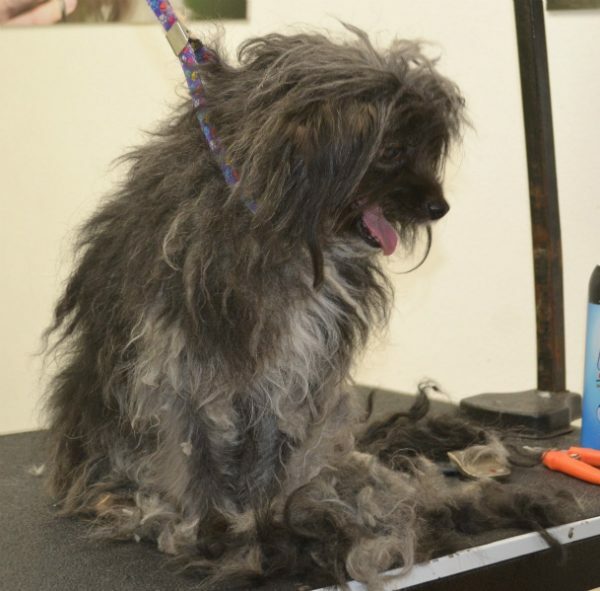 In the case of Neville the Terrier mix, a good groom was all it took to turn back the clock and reveal the adorable pup hiding in a shaggy old shell. “It took years of off him,” Jessica Gercke of the Helen Woodward Animal Center tells Dogster. At 6 years old, Neville has a lot of life left in him, but when he ended up at a shelter in California’s Yucca Valley, potential adopters kept passing him by. Weighed down by his dusty, knotted coat, Neville couldn’t compete with young puppies. It seemed people perceived him as being too old to adopt — something shelter workers knew just wasn’t true. “A 6 year old dog of that size could have another five to 10 years ahead of him,” Jessica explains. Not only did Neville have a lot of life left in him, but he also had a lot of love to give. Although the condition of Neville’s coat and teeth suggested he’d been left outdoors and neglected, his personality was consistent with a dog who’d been loved and cared for. He was probably someone’s beloved pet at some point, and clearly couldn’t wait to be cast in that role once again. 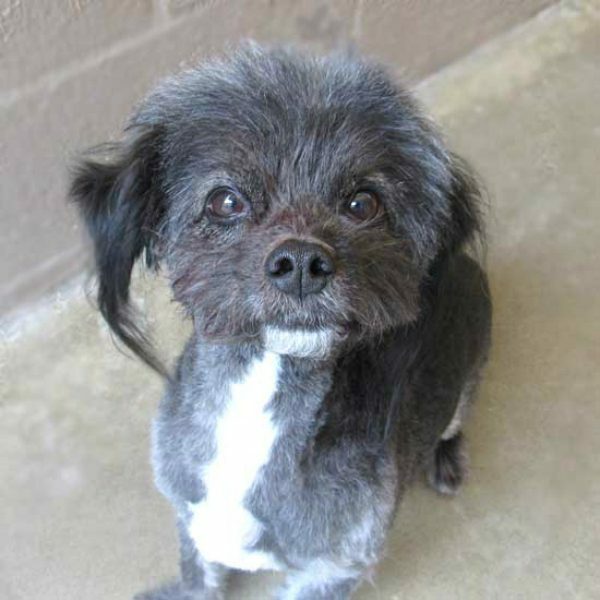 The shaggy dog charmed the staff at the Yucca Valley shelter with his sweet personality, and when he was still in their care after several weeks, they called the Helen Woodward Animal Center in the hopes of giving him another chance to get noticed. According to Jessica, 90 percent of the animals at the center come from shelters like Neville’s. The facilities may be overcrowded or just financially unable to give a pet the extra help they need to get adopted. In Neville’s case, that meant a makeover and a dental overhaul, both things the center could do. 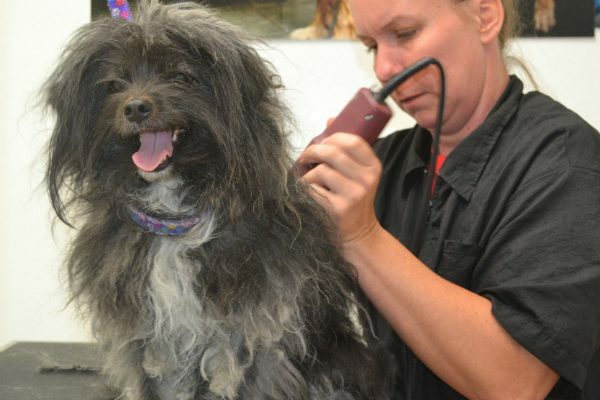 When Neville arrived at the Helen Woodward Animal Center, he was booked into the onsite salon, Sydnee’s Pet Grooming, where he continued to impress everyone with how ready he was to be a pampered pet. When the folks at Sydnee’s had removed all of his overgrown coat, it was time for the veterinary team to take over and remove the other symptom of neglect weighing Neville down: some rotting teeth. After a some downtime to recover from the dental work, Neville became adoptable — and he still is. This people-loving pooch is just waiting to be whisked away to his new home. According to Jessica, he’s the kind of dog who could fit in in many different scenarios. At 6 years old, Neville’s age puts him in that sweet spot for dog energy in which he’s still got enough, but won’t wear you out. “He’s got enough to go on errands and join you for a great walk — but then come home at night and rest and watch TV with you,” says Jessica, who is hoping Neville finds someone who will take him places and let him see the world. At 13 pounds, he’s perfectly portable. “What I want the most is for him to have someone who dotes on him. I think he really deserves that at this point in his life,” she says, pointing to Neville as an example of why potential adopters shouldn’t write off the less polished dogs in a shelter. “Even if you’re looking at [a shelter] that doesn’t have the ability to do what we did with Neville, know that there are incredible diamonds in the rough,” Jessica explains, adding that often a shelter pet’s problems were caused by people, and can be fixed by people too. Now that Neville is shining bright, he’s eager to become the crown jewel of someone’s life. For more information on this sweet dog check out animalcenter.org. The post Neville the Terrier Hopes His Dental Work and New ‘Do Get Him Adopted appeared first on Dogster.